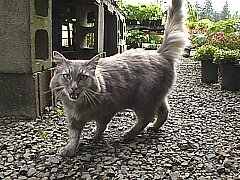 Fluffy Lives with her brother Ivan, sister Tibby, and new friend Widget at Raintree garden supply in Seaside, Oregon. 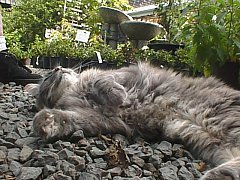 They each have their own territory, and Fluffy's is to the south of the store, which includes a greenhouse area. She has been known to have all kinds of things hanging from her fur: sticks, leaves, etc. 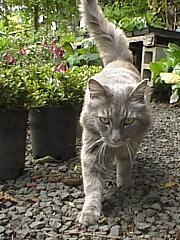 Fluffy is very friendly and loves to be petted. She also has a funny meow that sounds like she has a scratchy throat. She enjoyed being picked up and purred loud for that! She is a very sweet kitty. *Note: Fluffy died in November of 1998, about a week before Thanksgiving. She had eaten a poisoned rat. 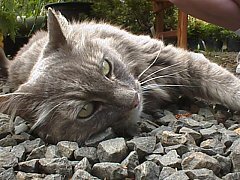 Her half-sister Rose died earlier this year.